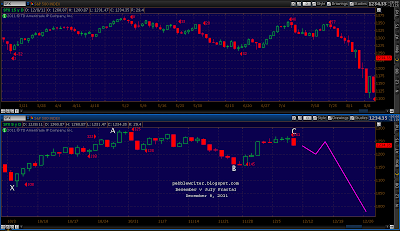 The fractal we discussed yesterday played out perfectly today (the equivalent of July 8-11, 2:3 time ratio.) 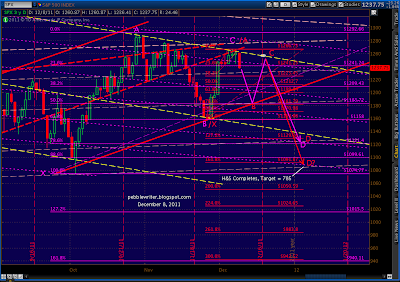 Look for more downside (targets discussed earlier today) before a rebound next week. 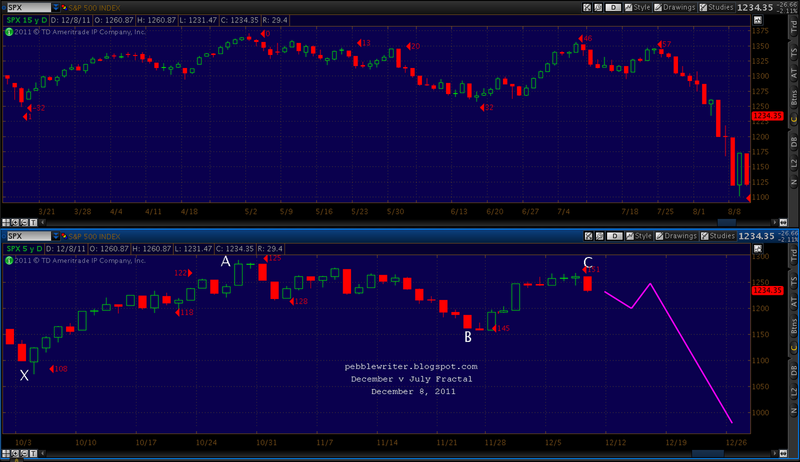 The cynic in me expects the July 22 rebound high to line up with OPEX Friday, but we’ll see as we move along. Clearly someone trading in SPY had the same idea about an IH&S; pattern, and ran up the equivalent of 27 SPX points in the minutes after the cash market closed. It came right back down, of course. The reversal at the triple top of 1266 goes a long ways toward validating the primary channel lines (yellow, dashed) I’ve been assuming are correct. 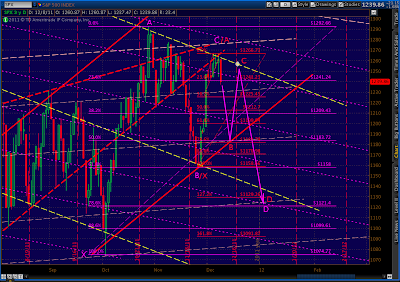 The contra-channel lines (red, upward-sloping) should provide some guidance on the way down from here. As always, the primary channels become contra after a change in direction, and vice versa. Naturally, they aren’t the only channel lines that matter — far from it. But, they’re the ones that have most of the action since the March 09 lows. There are many possibilities for how this plays out. 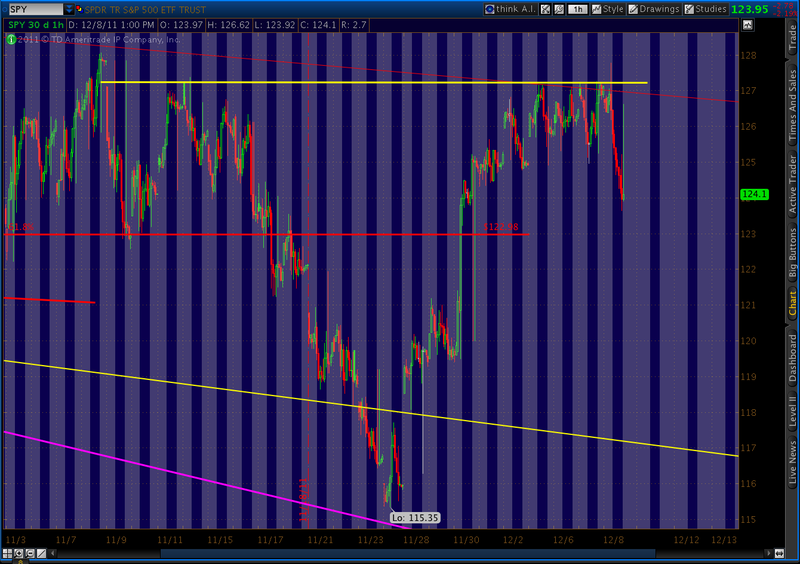 For one thing, this move down says nothing about whether there’s another leg up past 1292 or not. Some Elliott Wavers are adamant that this is the B wave down in the C wave up of a larger A-B-C move from 1074 to 1307 or so — a corrective wave 2. 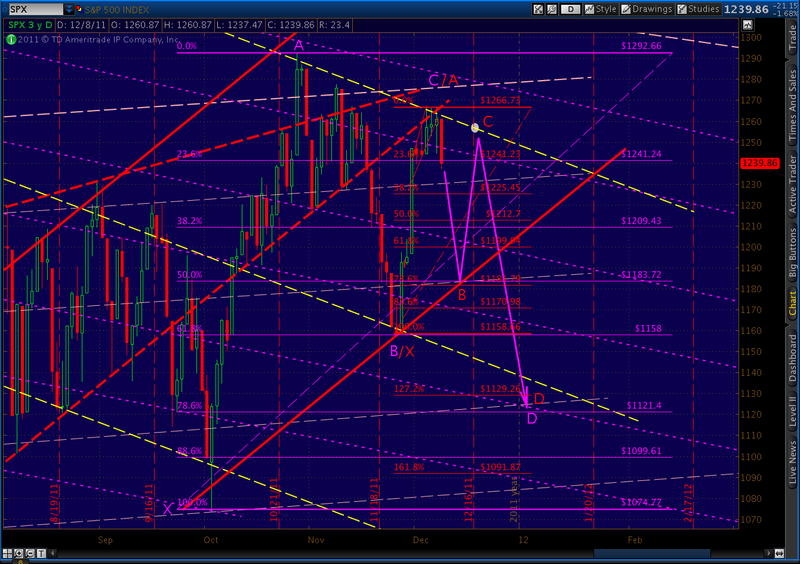 Looking at the charts, there is a very good case to be made for 1307-1313. It’s my top alternate. 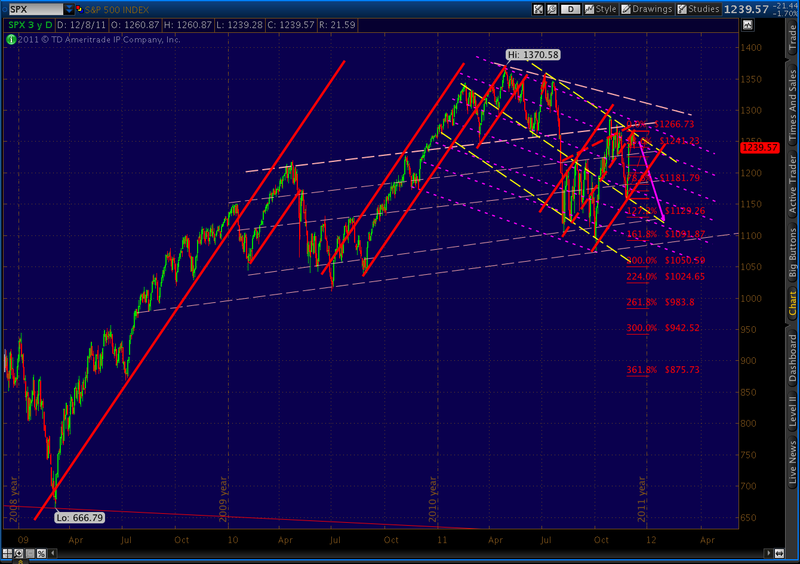 It’s also just as likely that this is the first wave down of an impulsive wave 3 down. If so, things will get real interesting real fast. Since we won’t know till we know, let’s look at some near-term possibilities. 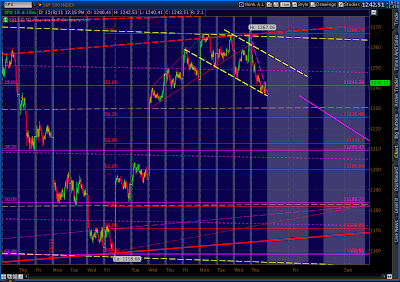 Remember, we’re working on a large Gartley pattern (in purple, below.) 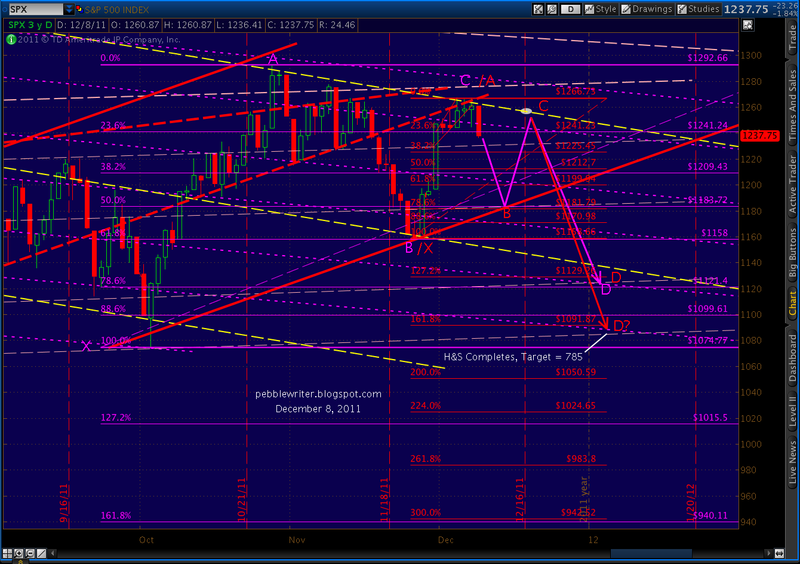 Our Point D target is 1121. With that in mind, it makes sense to see how we might get there. We discussed this possibility over the past few days. 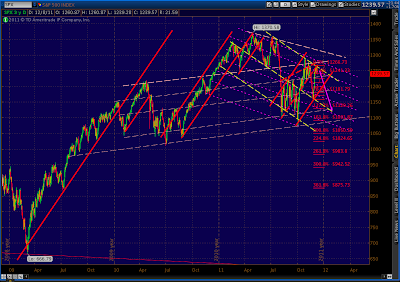 It’s an analog to both the July 2011 and the December 2007 markets and would trap an enormous number of bulls. It would also crush the many bears who would go max short for the move down, only to see a rebound right around OPEX next Friday. The same IHS fakeout possibility exists with other right shoulders, BTW, including any of the fib levels between 1181 and 1225. 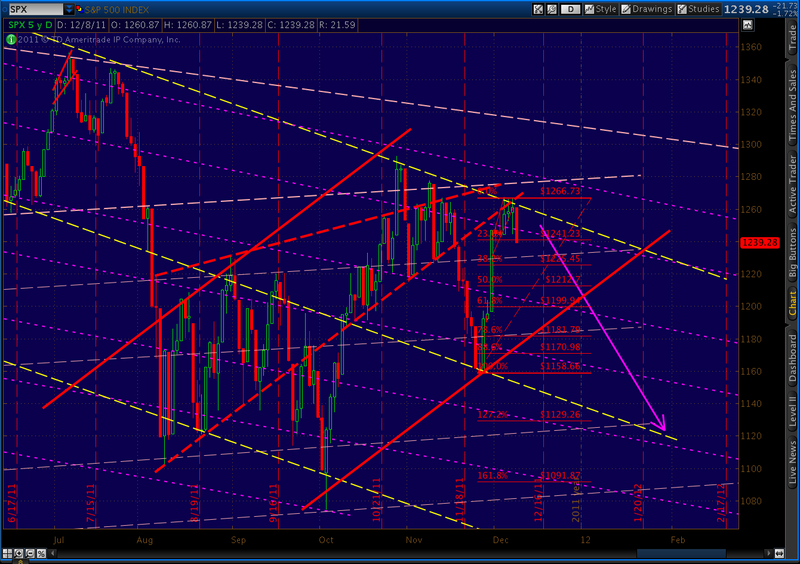 The key ingredient is a bounce back to just short of 1266. 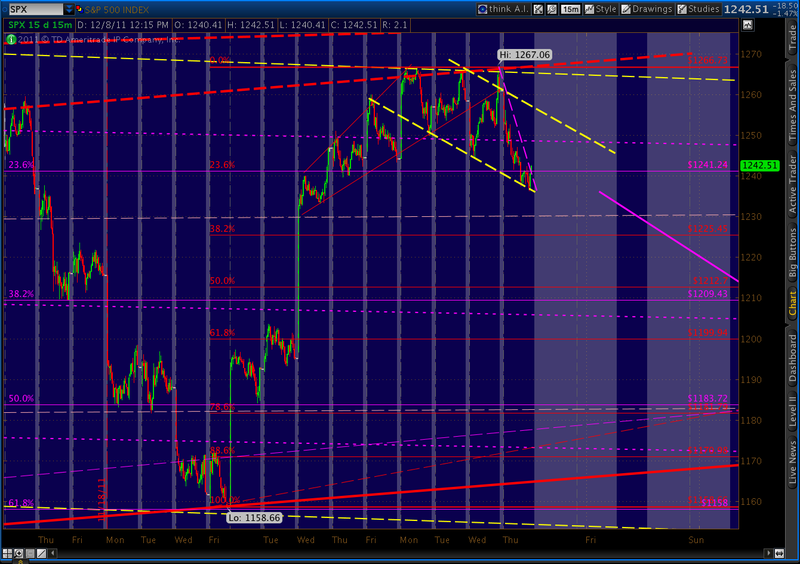 Reaching even the 1.618 extension on the current Gartley would take us to the 3.00 on the Butterfly, both at 940ish. 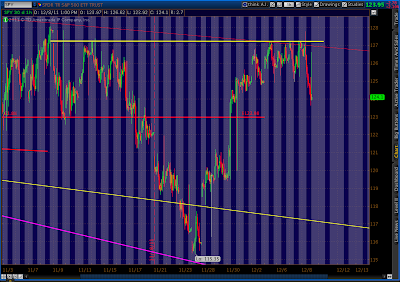 Of course, a move below 1085 or so completes a massive H&S; pattern that would target 785 on the downside. Remember what I said above about things getting interesting? With all that out of my system, please understand this is a like a high stakes game of “If You Give a Mouse a Cookie.” Something benign leads to something else ominous that leads to other stuff that’s just plain ugly. 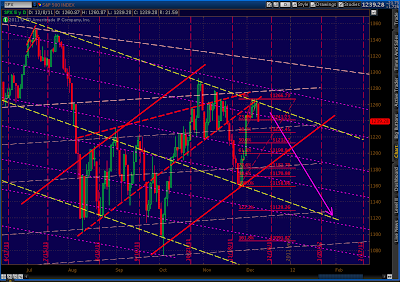 But, there is absolutely no requirement that we dip all the way to 1182. As I speculated yesterday, we have established a downward-sloping channel (dashed, yellow) that would take us to any of the afore-mentioned targets. If, however, we place another trend line (purple, dashed) in just the right place, today’s move down looks a lot like a falling wedge. I think that SPY spike you mentioned must be a bad print. I don't see anything similar in the futures. (There was a spike to ESH 1240 around 3:30 pm, but that corresponds to SPY 124.5-125, nowhere near the nearly 127 level that appears in your chart. Glad you like it. I have a traditional Wall Street background/education in economics and securities analysis. But, I threw most of that out and started all over six months ago, trying to figure out what really worked consistently. Most of the tech stuff I use every day comes from observation (discovery) that I later find out is well-known and used by many others: harmonics, fan lines, everything Fibonacci, regression channels, etc. In other words, I've observed it working — then went and studied what others have written. Having said that, you could start with John Murphy's book on TA and Tom Bulkowski's book on chart patterns. The websites I mention to the right are usually very good, and Ron Walker does a nice nightly wrap up of tech stuff @ thechartpatterntrader.com. Thanks again for all your hard work. I have a rudimentary understanding of Elliott Wave theories and application. I would like to get a more in depth understanding on the technical tools you use like the harmonic patterns and fan lines. Any recommendations learning tools. I am still very much the novice but the your method of analysis intrigues me.